A table with a navigatable tree in the first column. A WTreeTable implements a tree table, where additional data associated is associated with tree items, which are organized in columns. 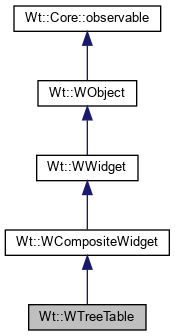 Unlike the MVC-based WTreeView widget, the tree renders a widget hierarchy, rather than a hierarhical standard model. This provides extra flexibility (as any widget can be used as contents), at the cost of server-side, client-side and bandwidth resources (especially for large tree tables). The actual data is organized and provided by WTreeTableNode widgets. To use the tree table, you need first to call addColumn() to specify the additional data columns. Next, you need to set the tree root using setTreeRoot() and bind additional information (text or other widgets) in each node using WTreeTableNode::setColumnWidget(). Thus, you cannot change the number of columns once the tree root has been set. The table cannot be given a height using CSS style rules, instead you must use layout managers, or use resize(). // Populate the tree with data nodes. Creates a new tree table. The treeRoot() is 0. The table should first be properly dimensioned using addColumn() calls, and then data using setTreeRoot(). Add an extra column, specifying the column header and a column width. The extra columns are numbered from 1 as column 0 contains the tree itself. The header for column 0 (the tree itself) is specified in setTreeRoot(), and the width of column 0 takes the remaining available width. Returns the number of columns in this table. Returns the number of columns in the table, including in the count column 0 (which contains the tree). Returns the column width for the given column. The width of the first column (with index 0), containing the tree, is implied by the width set for the table minus the width of all other columns. Returns the header for the given column. This is the widget that contains the column headers. Sets the tree which provides the data for the tree table. Sets the data for the tree table, and specify the header for the first column. The initial root is nullptr. Returns the tree that provides the data this table.